Welcome to Bonanza: Scenery Of The Ponderosa! Dedicated to the legendary and most-beloved TV Western series of all time. Today, the series is seen in 30 countries, in 12 languages, and over 280 million viewers worldwide in reruns since 1973. It was the first television series designated to be filmed and broadcast in color in the great outdoors and second longest-running next to Gunsmoke. This web site is a dedicated shrine and preservation of the series history, its stars, filming locales in three states and the 430 episodes broadcast from September 12, 1959 to January 16, 1973. Many other outstanding features include the famous opening sequences, lyrics to the famous theme song, horse biographies, monthly calendar, many photos and screen captures, and live Lake Tahoe sky cams. This labor of love is going on 26 years strong and will continue to prosper in memory of Michael Landon, Pernell Roberts, Lorne Greene, Dan Blocker and the Cartwright Family. 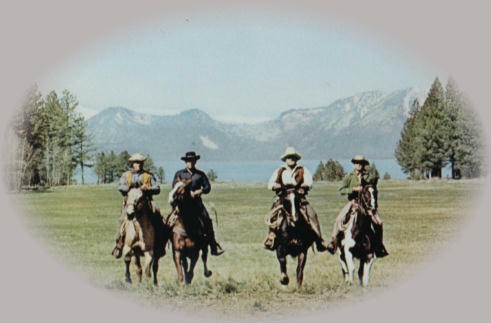 America's most-beloved fictional-family of the great Ponderosa Ranch on the glistening crown of Lake Tahoe in the Sierras. Visit BONANZA The Official Eighth Season on Facebook! Click Here For Bonanza Forum! Click Here for Breaking Bonanza News! Click to read "The Ponderosa Spirit" by Joan Markowitz! The names and likenesses of the characters appearing in the "BONANZA" and "THE PONDEROSA" photoplays, and any images and pictures from such photoplays, are collectively the copyrighted and trademark-protected property of Bonanza Ventures, Inc. and NBC Universal, Inc. and are made available only for private, non-commercial use. Please take notice that any use of this material for any commercial use, or any unauthorized display, distribution, transmission or other use of this material, is expressly prohibited and constitutes a violation of the rights of Bonanza Ventures, Inc., and NBC Universal, Inc.
All images from "BONANZA" are Copyright © 1959-2019 Bonanza Ventures, Inc., and NBC Universal Inc. All rights reserved. BONANZA™, ® THE PONDEROSA™, ® and all related indicia are trademarks of Bonanza Ventures, Inc. Used with permission. New York 11367 -2331 U.S.A.